While there is a strong tendency towards bigger fan unit right now, we have often been asked for a powerful Micro Fan. This completely new fan is another design by Ulf Herder, utilizing CAD/CAM techniques. It has a 50 mm inner diameter and accepts motors up to 25 mm in diameter. 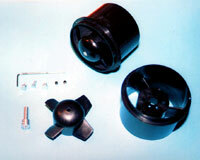 The rotor is mounted on a prop adaptor which fits onto the motorshaft. Adaptors are available for 2.0, 2.3, 3.00 and 3.17 mm motor shafts to fit all commonly available motors. The fan unit was designed around the robbe power 330 (SPEED 300) motor, which gives about 200g of thrust on eight (small) cells. The rotor is glass reinforced and is rigid enough to accept the power of brushless motors, as delivered by Lehner, Hacker, Astro and other manufacturers. Because the rotor operates at extremely high rpm, we recommend the use of ball race motors like Multiplex Permax 280 BB or similar. For the battery we recommend GP 1100 cells with single engined models and GP 2200 for use with twin engined models. The fan unit comes without an intake lip, which therefore needs to be part of the model. The perfect nozzle shoud be about 40 mm in diameter.